This is a Guest Post from a fellow Old Timer. The idea comes from The Overlords Podcast. It's how to make craters using a particular kind of glue. I'm told it takes a few hours to do since you need to wait for the layers of glue to dry, but its not a terribly complex process in all. 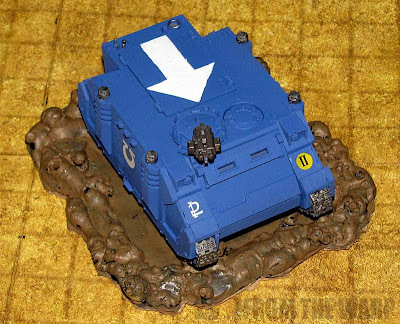 The idea is to have a ready made crater for when your vehicle or dreadnought gets completely obliterated. It helps to add some life to the game instead of just leaving an unused blast template there or "pretending." 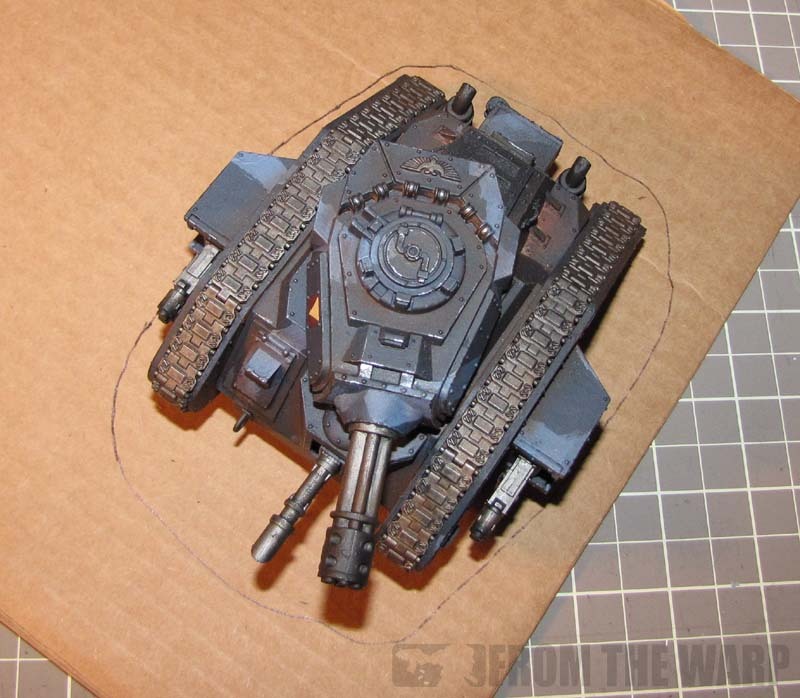 Once you have the vehicle you want to make the crater for, you need to set it on top of your cardboard and trace its outline. It doesn't have to be exact, but you want to be close as it's a representation of the vehicle that was just there a minute ago. That and making it about the same size will prevent any arguments with picky opponents. Once you have your rough outline, it's time to get right to work with the glue. We're using Gorilla Glue (that's the brand name) for it's expansion properties. 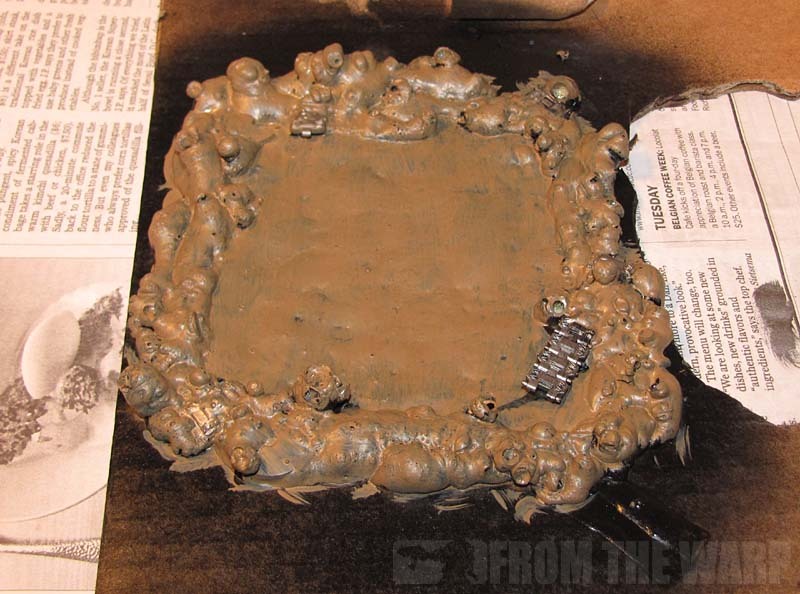 As it dries, it's going to expand and give us that crater look with the raised edges. The first layer of glue is spread inside our vehicle outline. Using your old paintbrush, give the crater a good, solid coat of glue. 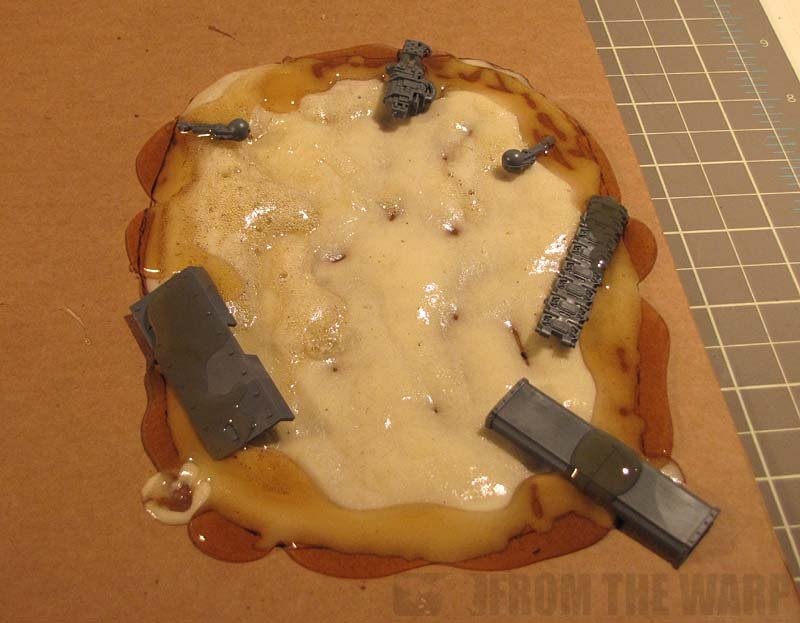 Once the first layer of glue dries (about two hours), you can add your second layer of glue (around the outer edge of your template) and any bits you want to represent what remains of your prized vehicle after it was totaled by a lucky meltagun shot. 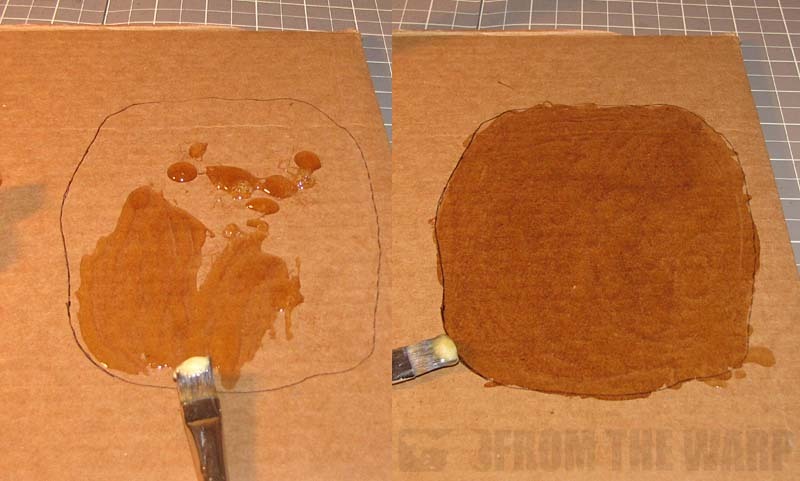 And here's the trick to making the second layer a bit more puffy than the first. After applying the second layer of glue, take your water bottle and give the still wet glue a few mists with water. This will push the expansion of the glue more than normal. 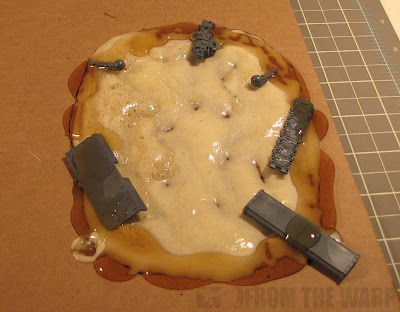 It's another wait of 2 to 3 hours after applying the second pass of glue for it to completely dry and puff up like it should. 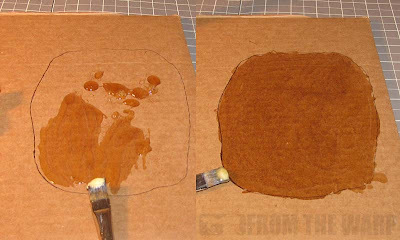 Once your second layer of glue has dried, cut your crater out from the piece of cardboard and get some paint on it. It doesn't have to be fancy, if you have a table at home, you can match that or your local game store tables. This one was given a quick spray of black and then drybrushed with GW Graveyard Earth. The bits were touched up with GW Boltgun metal so they stand out from the ground. All in all, it's not anything that is going to change the outcome of the game, it's only going to get you the style points with an opponent and should your vehicle be sent to the Machine God in the sky, you'll have a nice marker to show where it was just a second before. I like it, but I'm thinking something a little more irregular in shape would look cooler IMO. Same technique though... I think I'm gonna try this out. Reece: Absolutely, you can make them any shape really. It's just another piece to help the game go a little smoother. Very neat idea. 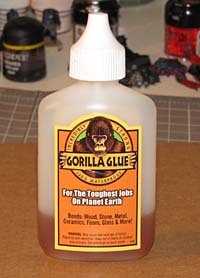 I'd heard some odd things about Gorilla Glue, and this appears to be one of them. I went the quick and easy route with pieces of black and brown felt cut to shape and glued concentrically. Not as 3-D, but dirt cheap. Interesting, cheap and easy! I know a favorite around my area is sprue chunks for rubble. Cut them down and glue them in piles. Makes for cheap and easy rubble that I could see working well with small bitz or those who don't quite have a box of them yet. 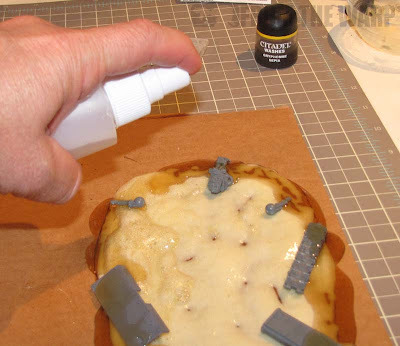 what type of glue is glue - want to try and find a similar version over in Europe. draven3410: You'll need Gorilla Glue. That's the brand name. I don't know if it's available in the UK though. It might be something you'd need to get online. will look into it. Thanks Ron! Excellent tutorial, thanks for posting! You know, you could probably do this with a hot glue gun, and it would be a little cheaper, and easier. Not trying to dis what you've done, because I love the idea, but a hot glue gun just seems quicker, cheaper, and easier. Taubeast: Good point. That might work just as well if not better in some cases. Thanks for sharing the idea! This is really inspiring! I just realized I never actually thought about scratchbuilding craters before... That's going to change now. And yeah, hot glue gun might work as well, I think.